Hi Sweet Friends, I’m Panache Desai. How do you address your anger and tame your temper? There’s really only one way and that is to meet it with patience, empathy, compassion and love. That’s the only way we can really and truly tame any aspect of ourselves. By understanding that there is no part of us that is wrong… That in truth, there’s no part of us that really needs to be tamed. The degree to which you’ve been taught to deny your anger is the degree to which it is now erupting within you with heightened volatility. It is for that reason you must be empowered to nurture, love, trust and surrender to that part of you that wants your attention. 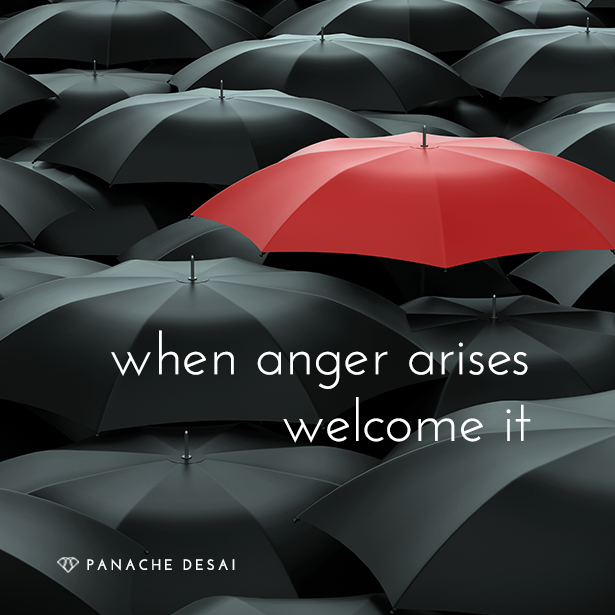 How do you surrender to the experience when anger arises? Know that in doing so, you are setting yourself free. That which is embraced returns to flow. That which returns to flow sets you free. Flow and harmony are your natural states of being. Embrace your anger. Give up the need to tame it and recognize that your anger is an essential part of you that just simply wants to be felt. Share the image below to your Facebook Page. Sign up for a free membership on PanacheDesai.com. I’m an author, contemporary thought leader and a Vibrational Catalyst, and it has been my honor to empower individuals like you to live the moment to moment experience of their lives connected to their magnificence. I often hear from people how they contain their temper in some way thinking that their temper is some unruly thing that needs to be reined in… All the while missing the point that it is that belief that we can reign in our temper that is leading to the heightened experience of it that we have in moments where we are triggered. There’s really only one way to address your anger and to tame your temper and that is to meet it with patience, with empathy, with compassion and with love. That’s the only way, my sweet friends, we can really and truly tame any aspect of ourselves. By understanding that there is no part of us that is wrong… That in truth, there’s no part of us that needs to be tamed. We just simply need to surrender to the experience that we’re having, and in doing so, be with it. Because to be with our temper is to love it, is to transform it, is to shift it from it being something that is ugly that we have to lock away and hide, to it simply being something that is a part of us, that’s a part of life and living. The degree to which you’ve been taught to deny your anger is the degree to which it is now erupting within you with heightened volatility. It is for that reason, my beloved friends, that you must be empowered to nurture and love and trust and surrender to that part of you that wants your attention. Because, you see, it really has nothing to do with anything outside of you. It has nothing to do with your life situation or circumstance… The only person that is in charge of your emotional state, or that is available to bring it into completion, is you, and it is for that reason you must relax into the experience of anger. It is for that reason that you must relax into feeling whatever there is to feel and most importantly of all, once again seeing the beauty in the anger that you have, turned into something that is beastly. That you’ve turned into something that is repulsive. You see, the reason why we have that stigma attached to our anger is because we live in this culture of repression or suppression and denial and the degree to which we do that is the degree to which it gets stuffed deeper and deeper and deeper into our subconscious. So much so that it gets hidden away until eventually something happens in life that reminds us of its presence, at which point, once again, we feel overwhelmed and simply horrified at the fact that once again this ugly part of us has made its way into our lives and into the forefront of our experience. So when anger arises, embrace it, welcome it, meet it with love, offer it compassion, offer it your heart, offer it your beingness, and know that in doing so you are setting yourself free.